Ethiopia's government has been withholding foreign aid from opposition supporters, Human Rights Watch says. Ethiopia is one of the world's largest recipient of development aid - in 2008 international donations to the country totalled $3bn (£1.8bn). An Ethiopian government spokesman dismissed the report as the "usual lies", while the UK denied turning a blind eye to the misuse of its aid. The UK's Department for International Development, one of Ethiopia's biggest donors, said it did not think there was widespread or systematic abuse of aid money by the Ethiopian government. An Ethiopian government spokesman told the BBC that the report was the "expression of frustration from Human Rights Watch for failing to achieve regime change through the elections". Human Rights Watch says its findings are based on a six-month investigation last year. "We visited 53 villages in 26 districts in three regions of Ethiopia and we talked to about 200 people," Human Rights Watch researcher Ben Rawlence told the BBC's Network Africa programme. "We found systematic discrimination from one end of the country to another against people who were members of the opposition party or people who disagreed with the regime." This case illustrates a dilemma for the donors. The recent trend has been to give money direct to governments. This can help build the capacity of developing country governments to solve their own problems - as opposed to employing expensive expats. The potential disadvantage is that this takes quality control away from the donors - what Human Rights Watch says happened in Ethiopia. The other dilemma donors have is that they sometimes quite like dealing with authoritarian administrations which get results. 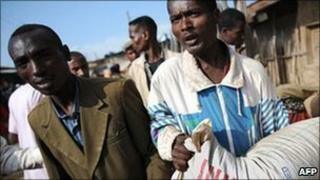 Even Human Rights Watch admits that the Ethiopians are making a positive impact on poverty. And of course poverty reduction is not the only target. Ethiopia is seen in the west as a bulwark against the chaos of Somalia and the possible chaos in Sudan if the south's planned independence referendum in January goes terribly wrong. Development policy is about helping poor people; but it's about power politics too. Villagers, who are often subsistence farmers, were rejected for micro-credit loans, seeds, fertiliser, food aid, housing if they were a member of an opposition party, he said. "University places are conditional on ruling party membership, promotion in the civil service - if you're a teacher or a nurse or a bureaucrat in a government ministry - all of these things are conditional on loyalty," Mr Rawlence said. "People are being asked to disassociate themselves from political parties - rescind comments they've made and write out letters of regret - in order to obtain food aid." Efforts to confirm the stories of discrimination with regional officials, civil society, opposition leaders and journalists revealed that this was how things commonly operated, he said. The group says many donor officials privately acknowledge there is a deteriorating human rights situation and growing authoritarian rule. At the same time it is generally accepted that Ethiopia is making impressive progress as it tries to develop. In May, Ethiopia's governing party trounced the opposition in elections - only one opposition MP was elected in the 536-seat parliament. Many analysts suggest the muzzling of the opposition was a major factor behind the governing party's sweep to victory in May. "If independent NGOs were allowed to work, civil society was allowed to play its role and international NGOs were allowed to distribute directly to Ethiopian citizens then you would cut out the pernicious role that the state is playing," Mr Rawlence said. "People were very, very scared about talking to me - they would only do so in safe-houses," he said.